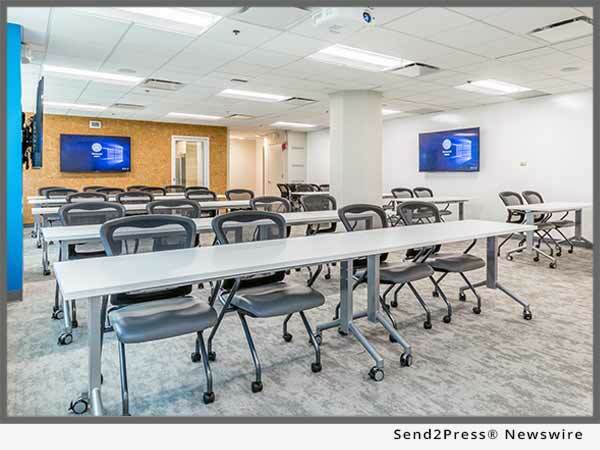 Home National News Desk WorkSocial opens new coworker and training space in Jersey City, N.J.
WorkSocial opens new coworker and training space in Jersey City, N.J.
JERSEY CITY, N.J., Jul 24, 2017 (SEND2PRESS NEWSWIRE) — WorkSocial, Jersey City’s premier coworking and shared office space, is excited to announce they were the official host of John Maxwell’s leadership workshop. On June 28, 2017, The John Maxwell Company brought “The 5 Levels of Leadership” Workshop to the area. The event was held in WorkSocial’s newly-opened training space located at 111 Town Square Place, Jersey City, NJ 07310. “We are so excited to have been able to host The John Maxwell Company’s leadership workshop,” said Natasha Mohan of WorkSocial. “Dr. Maxwell has been a prominent voice on the subject of leadership culture development for many years, and we were thrilled for the opportunity to have them at WorkSocial. Those who attended the “5 Levels of Leadership” workshop learned how to develop a leadership culture that infuses a common leadership language the entire organization can speak and understand, quickly shift the culture from positional and title-driven to relational and influence-driven, and develop a framework for consistently reproducing leaders. For more information on the workshop, visit http://johnmaxwellcompany.com/. Visit https://www.worksocial.works/ to learn more about WorkSocial’s new training room rental for corporate workshops. WorkSocial is a premier coworking and shared office space located in the heart of downtown Jersey City. WorkSocial creates unique experiences that redefine one’s work life by bringing wellness, happiness, and leadership to the workday. WorkSocial provides access to everything one needs in order to work efficiently, productively, healthily, and happily. *PHOTO Caption: Training Room Picture Caption: WorkSocial’s Training Room has the capacity of 36 and offers an all-inclusive experience for clients.